It is difficult for a decentralized project to answer the same-old question “When roadmap?” since writing a roadmap is a task for a central coordinator or authority that decides what the plan is. 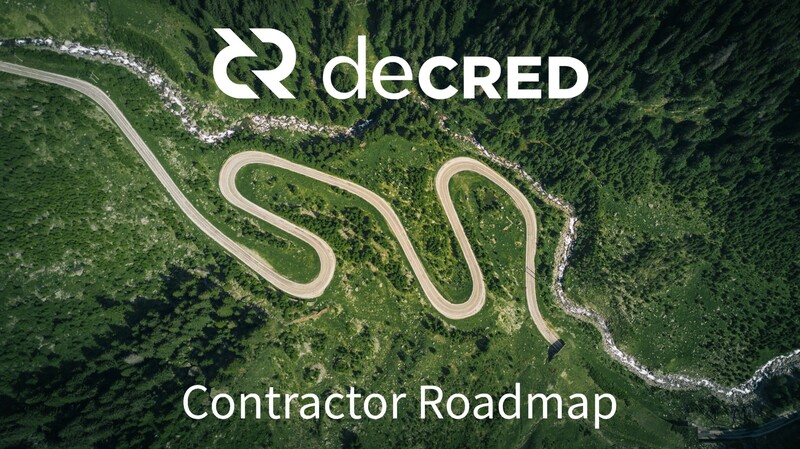 Previous editions of the Decred roadmap were really the Company0 roadmap for Decred, but we have reached a degree of decentralization where this no longer makes sense. Company0 no longer accounts for the majority of development work, and is barely represented in some domains. Politeia and the roadmap page are now the platforms where Decred’s global roadmap is iterated, but it doesn’t provide an accessible summary of what the plan for Decred in the near future is. The concept of a roadmap still makes sense for individual contractors, both corporate and independent. Individuals have the autonomy to plan for the year and make those plans known, should they choose to. A number of independent contractors thought it would be useful to produce a shared roadmap document where we each have a space to talk about our plans. This should be considered a non-binding document. People change their minds sometimes and circumstances change. Continue producing Decred Journal. I hope to delegate more work to free up time for other ideas. I started contributing to Decred 2018 and the response from the community has been very positive. My primary goal is strengthening Decred’s security. I do this by selecting 2–3 active projects per month and working on them, I will continue this cycle in 2019. There is joint research and development Decred git/contributor analysis work that is being done by both me and @s_ben. The Bug bounty proposal that I put up has passed, I expect this will take up the bulk of my time Q1 of 2019 as we work out any hitches in the rules, scope, methodology etc. After that I will use the knowledge gained from running the program to start working on a bug bounty website (for submission, triage, work allocation etc) based on Politeia. I will NOT be billing the project for this work. The plan to get it built up to a POC stage first before I ask the community for funding and extra hands via a Proposal. I will also continue helping out the community wherever possible both offline and online. As an Event Support and Social Media Marketing contractor, my job is to make sure to stay on message with Decred’s team of independent contractors and the community at large. I’ve been with the team since October of 2017, helping shape the Facebook page and develop verbiage for our social media posts on various platforms. Beyond the digital front, I have contributed at many events, including Consensus and Texas Bitcoin Conference. Bringing new users to the fold by having the ability to speak passionately and knowledgeably on a subject is essential to our marketing efforts. In 2019, I intend to increase public appearances at local cryptocurrency meetups to spread awareness and tighten my public speaking abilities. I aim to ramp up assistance with social media marketing efforts to get in front of more eyes more often, and more effectively. As an entry-level software developer outside of the project, I also intend to focus much more attention to the technical details of our developers discussions and implementations within our code base. This will allow me to better communicate with engineer-minded individuals on the technical details of our project and our team’s accomplishments. In 2019, I hope to strengthen relationships with the team/community and offer support to the best of my ability. Anyone may feel free to contact me for questions on any of our platforms. My focus is currently on putting out a v1 of the decred mining pool implementation I have been working on as well as improving work delivery options for dcrd. With regards to the mining pool, quite a bit has already been done, the outstanding tasks are implementing stratum protocol, full cycle tests on simnet with chain reorgs, and support for all dcrd ASICS released so far. Currently dcrd requires polling for available work. Knowing the mining pool will need more efficient ways of getting available work I have been working with davecgh on allowing clients to subscribe for work notifications via a new rpc (notifywork). This is close to completion as well but requires a lot of testing due to modifications it makes. We also plan to fix issues with the current getblocktemplate implementation and reenable it. I also have a couple outstanding dcrwallet tasks that should update and reenable tests. As Marketing Lead, my goal for 2019 at Decred is to generate a consensus on the positioning and messaging, then implement tactics that cultivate the community and project its message. I recently released a blog detailing the hiring of Ditto, a public relations firm, and we’ve begun work on messaging. Once this is set, we’ll build out the website to reflect the new messaging and add content that offers a deeper dive into Decred without the need to review the docs. I’ll present a proposal in the near future that details my plan including budget for the ongoing communications that will include video production and event presence/participation that will build upon Decred’s strengths and extend it to new geographies. First the building blocks, then the funnel, then the message projection to drive new users into the funnel. My main contribution to Decred in the past 6 months has been organizing meetups for the crypto community in Mexico, connecting with exchanges in Latin America (Latam) and translating basic content for the Spanish speaking audience. 2019 will be a great year to continue expanding Decred outreach in Mexico and Latam. There are already plans for the next 3 meetups in Mexico City for January, February, and March. In April we will have an expo booth in Talent Land 2019, the biggest tech expo in Mexico and Latam where we are expecting to show the project to more than 33k attendees. I have started conversations with 5 exchanges in Latam in order to have DCR listed this year against MXN, ARS, CLP, and COP. I will continue managing the twitter account @Decred_MX and the Medium Decred en Español for fundamental readings and information of Decred in Spanish. Following the steps of Decred BR, I am looking forward to expanding DCR presence in all the Spanish speaking countries and grow our community base in Latam. Contents : Making Decred related contents more accessible to the community, include but not limiting to translating, writing, collaborating with Decred supporters, manage social media. I have expanded and consolidated Decred’s social media presence. I have written, reviewed and published multiple articles via the Decred Medium Publication. I have recruited developers and on-boarded contractors in the marketing, community and strategy fields. I have negotiated DCR listings with major exchanges worldwide. I have represented Decred at conferences throughout Europe. In 2019 my focus will be on the long term vision and strategy. I will work with new and existing contractors to make Decred one of the 5 biggest digital store of value projects in the world. I will keep writing articles and remain available for daily operations. To contribute more in the social media by writing and translating the main articles about Decred so it can reach a large number of the Arabic crypto members. To do and participate in more meetups/events locally and in other Arabic countries to expand the Decred project in the North Africa and the Middle East. 2019 is a period of time where I intend to step my game up and keep contributing in areas I’ve been involved in up to this point, namely meetups, writing, translation and outreach, and education, but ideally also branch out to something like video production. Meetups: My intention is to raise awareness of the project in my region, which is quite crypto-aware, and bring more talented, like-minded people like users, investors, and developers into the fold. The goal is to develop working relationships with people and institutions willing to give us a speaking platform and educate those interested through meetups, conferences, and more technically-oriented Decred presentations. The ideal outcome of activity in this field would be a sustained meetup presence at various local meetups and get-togethers throughout the country. Writing and Education: Decred never ceases to amaze me and it is this wonder and fascination with its fundamentals and propositions that I wish to communicate, to the best of my ability, through writing, hoping that in so doing some of it will rub off on people who will likewise become enchanted by its elegant complexity. I will try to develop original and interesting angles through which the Decred proposition can be communicated, and continue existing ones, like the Decred Infrastructure Interviews once interesting partners reveal themselves. Needless to say, this goes together with reaching out to potential new partners such as crypto news outlets and crypto websites and magazines to increase exposure and provide constant and reliable presence in the local crypto media space. Outreach: The ambitious though nebulous plan is to try and attract local players, like institutions, exchanges, businesses, etc., to Decred, partly through, possibly, striking up relationships by maintaining meetup and conference presence but also through pro-active outreach. This will also be attempted through the use and maintenance of local social media platforms and account such as the Decred_PL twitter account and Decred Polska Facebook page, now still in its infancy. Depending on time limitations this may be expanded to more participation in local crypto forums and message boards. I also intend to keep making Stakey plushies like these for the community to enjoy. It goes without saying that this is not an exhaustive list; it is subject to change and expand as new opportunities to benefit Decred emerge. Continue producing Weekly Video for Brazilian Community (Youtube Channel) and continue to help Emilio in Brazilian channels. Continue supporting newcomers. More Meetups in 2019 in Canada-Toronto and if as possible support in Brazil as well. Building an organic community in Canada, partners, markets and continue helping out the every Decred community (offline, online and in person as well). I’m thinking in separate features as media’s (e.g twitter/decredexplorer) or something like that to find different ways for people learn about Decred, like a thought structure, so everyone can choose each feature to see first (study the feature like a project and unified later (e.g atomic swap, politeia, spv, dcrdata, decrediton, etc), for the first impact using the docs.decred.org. Continue manage all media’s below and other channels as possible to help, improves contents, to use key words (suggestions that I saw in channels), bring more connections like volunteers, devs, holders, so they can help us to growth our community and network (natural process). Was really good in 2018, in 2019 I hope to help more. We have little to no price, moon, lambo discussion. Our group is new user friendly. We have NEVER added a member to our group. Our moderation system is decentralized with 12 members who can review the actions of other moderators to ensure integrity. We kick bots and bad actors to support a safer environment (most groups keep them to inflate numbers). Publish the results of the effort for the community. Determine the best resources to support an integration effort. Discuss the project in the Proposals group in Matrix to confirm at least some community support. Launch a proposal on Politeia for community support/funding of the project. Manage the relationship with the selected ATM provider and publish updates on the work while in progress. Assist in coordination of a jointly marketed ATM launch. I was invited to give my first Decred talk at a Seattle conference last fall and I am available for additional talks/invites in 2019 and will be seeking out those opportunities. I enjoyed meeting team members of other projects, investors, and enthusiastic community. Decred is also a very easy project to talk about because of the very high level of integrity. There are no subjects to avoid or areas to gloss over. Finally I am looking forward to contributing to the expansion of the DCC (Decred Contractor Clearance) project which is currently in development. As a moderator I’m excited to do what I can to support a structured and scalable environment that supports existing and new moderators and contributors in this novel decentralized space. More of the same, and maybe some new things. Politeia Digest: No longer on a weekly schedule, but regular updates in the same kind of format. It would be nice to automate some of the more mundane aspects. Research program: I’m looking forward to spending more time on this in 2019. There are some interesting projects being discussed — you can comment and use your Pi up/down comment votes to indicate which projects/ideas you would like to see progressing. Writing projects: My New Year’s resolution is to try and make these shorter and more focused. Helping out with whatever seems useful. I described my experience of working on Decred and plans for 2019 in more detail in this blog post. I think 2019 is going to be an exciting year for Decred, feels like the project is really starting to gain momentum in a number of areas now. My general plan is to continue focusing on technical documentation, while exploring opportunities to contribute code and analysis. On the docs front, I plan to continue interfacing with developers and porting relevant technical knowledge to dcrdocs. At some point, if there’s enough demand (and content), I plan to finish work begun by other contributors on a separate Decred Developer Documentation site. On the coding front, I’m currently collaborating with @degeri on the Decred git/contributor analysis project, a Decred Open Source Research initiative. I’m finding all the research ideas pitched so far generally fascinating, and will be looking for further opportunities to collaborate there. I’m also learning golang. My plan is to start with small tasks on Politeia and other go repos, learning by doing. If that goes well, will explore the possibility of contributing more substantially and billing for it. As I’m relatively new, I also expect to find other opportunities as the year progresses. I’m particularly interested in how the DAE evolves, Politeia, internal systems for processing information, recruiting, and DCR markets. Outreach — Help to increase presence on Linkedin (and possibly delegate) and grow the Decred community in the Greater Toronto Area (GTA) with Michae2xl. Research — More research articles. Develop a website that displays Security spend alongside other analytics Development. Repos — I have been helping make the user facing Docs more accurate and visual. Will continue to do more of this in 2019. I also plan to help out in other repos in 2019. Organization — I want to put together my own team of contractors to help on the above. All text was delivered by individual Decred contractors. Minimal editing was done, hence there is a difference in writing styles. Shout-out to Richard Red for writing the introduction. Send me a message via Matrix or submit a pull request if you would still like to be added to this year’s contractor roadmap.